Picked these up for $200 for the both from a guy I am doing a pedal repair for. Gotta say, I'm loving the Valverb. It's like the guts of an old 60s combo in rack form. Tube driven spring reverb with a 3 band EQ for the wet signal to really fine tune the mix, tube driven tremolo for that Classic pulse and an extra tube gain stage so it can be used as a boost on the front end of an amp for that Classic 60s surf and rockabilly tone. The tube driver is an interesting device too. Cool starved plate tube distortion, not scooped sounding like the original pedals and has a very 'brown sound' kinda thing going on. These are now headed for the rack in my desk so I can route them to any amps I'm working with. Go Six very cool , never seen a peavy valveverb before, better looking than their other stuff ! But they do make good gear. They only made them for about a year in the early 90s. They've got kind of a cult following now because they're comparable to a Fender tube reverb unit in terms of sound and build but with the added sweet trem and gain control. 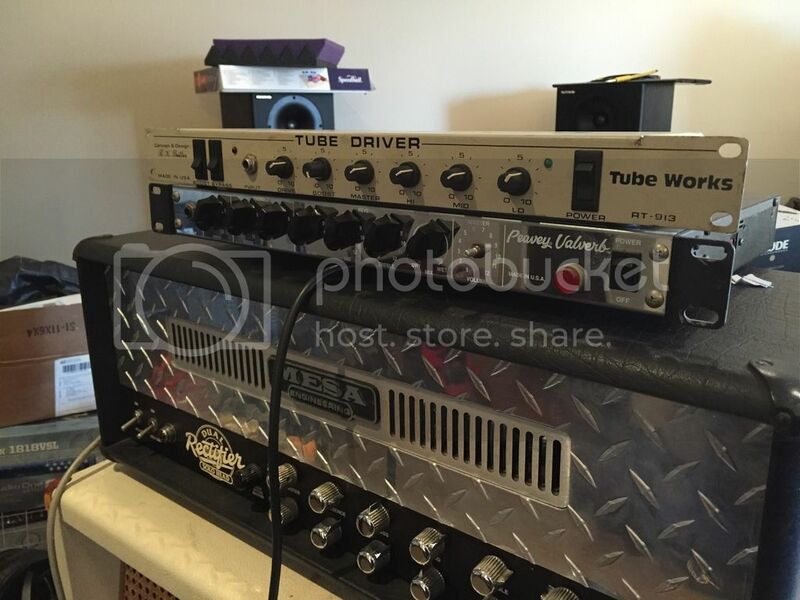 The Tube Driver is awesome....TS9Dlx in Rack format.